We create camera systems for quality assurance, production control and production monitoring worldwide in various industrial fields. Since 1990 we have specialized in image processing in 2D and 3D, so that we can draw on an ever-growing experience in this field. We provide complete solutions with handling systems and robots in cooperation with leading machine manufacturers. Our good contacts with research institutions ensure a future-oriented knowledge, which is included by the visolution engineers in the development of the systems. 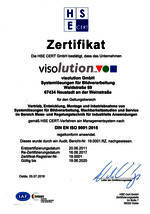 In close cooperation with our customers and partners we create total systems. These are sometimes around the clock and under the toughest conditions in use. Our clients are world market leader in many areas. We are partner system integrator of Cognex.